Located in the Large Magellanic Cloud, a satellite galaxy of the Milky Way, Supernova 1987A is the nearest supernova explosion observed in hundreds of years. It marked the end of the life of a massive star and sent out a shockwave of ejected material and bright light into space. The light finally reached Earth on 23 February 1987 — like a cosmic blast from the past. However, by observing the expanding remnant material over the years, Hubble helped to show that the material within this structure was ejected 20 000 years before the actual explosion took place. Its shape at first surprised astronomers, who expected the dying star to eject material in a spherical shape — but faster stellar winds likely caused the slower material to pile up into ring-like structures. The initial burst of light from the supernova illuminated the rings. They slowly faded over the first decade after the explosion, until the shock wave of the supernova slammed into the inner ring in 2001, heating the gas to searing temperatures and generating strong X-ray emission. Hubble’s observations of this process shed light on how supernovae can affect the dynamics and chemistry of their surrounding environment, and thus shape galactic evolution. This new image of the supernova remnant SN 1987A was taken by the NASA/ESA Hubble Space Telescope in January 2017 using its Wide Field Camera 3 (WFC3). Since its launch in 1990 Hubble has observed the expanding dust cloud of SN 1987A several times and this way helped astronomers to create a better understanding of these cosmic explosions. 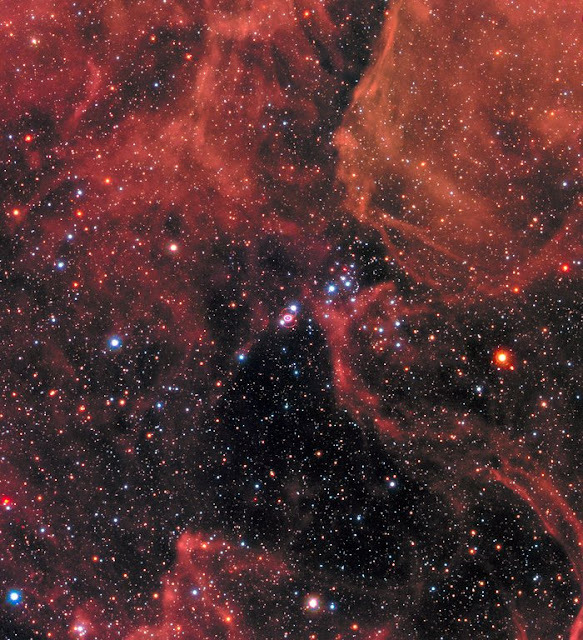 Supernova 1987A is located in the centre of the image amidst a backdrop of stars. The bright ring around the central region of the exploded star is composed of material ejected by the star about 20 000 years before the actual explosion took place. The supernova is surrounded by gaseous clouds. The clouds’ red colour represents the glow of hydrogen gas. The colours of the foreground and background stars were added from observations taken by Hubble’s Wide Field Planetary Camera 2 (WFPC2). This montage shows the evolution of the supernova 1987A between 1994 and 2016, as seen by the NASA/ESA Hubble Space Telescope. The supernova explosion was first spotted in 1987 and is among the brightest supernova within the last 400 years. Hubble began observing the aftermath of the explosion shortly after it was launched in 1990. The growing number of bright spots on the ring was produced by an onslaught of material unleashed by the explosion. The shock wave of material hit the ring’s innermost regions, heating them up, and causing them to glow. The ring, about one light-year across, was probably shed by the star about 20,000 years before the star exploded. Astronomers combined observations from three different observatoriesto produce this multiwavelength image of the remnants of SN 1987A. The red colour shows newly formed dust in the centre of the supernova remnant, taken at submillimeter wavelengths by the Atacama Large Millimeter/submillimeter Array (ALMA) telescope in Chile. The green represents the glow of visible light, captured by the NASA/ESA Hubble Space Telescope. The blue color reveals the hottest gas and is based on data from NASA’s Chandra X-Ray observatory. The green and blue hues reveal where the expanding shock wave from the explosion is colliding with a ring of material around the supernova. This ring was initially illuminated by the ultraviolet flash from the explosion, but over the past few years the ring material has brightened considerably as it collides with the expanding shock wave. Chandra: NASA/CXC/Penn State/K. Frank et al. 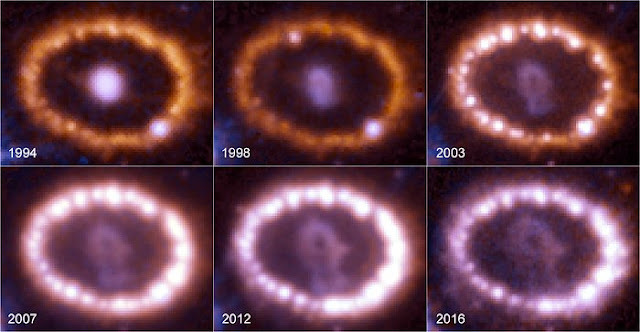 This time-lapse video sequence, created of images taken with the NASA/ESA Hubble Space Telescope, reveals the dramatic changes in the ring of material around the supernova 1987A. The images, taken between 1994 to 2016, show the movement of debris from the supernova within the ring. The ring, about one light-year across, also begins to brighten as the shock wave of material hits it. 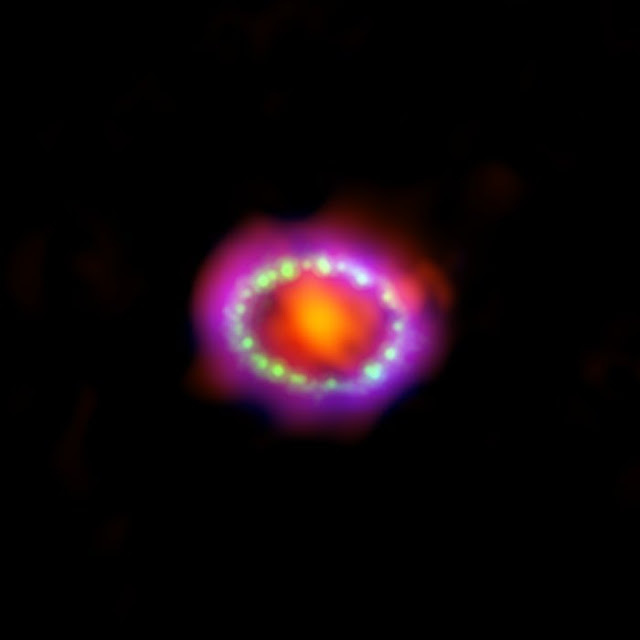 Using computer simulations astronomers can visualise the development of the supernova 1987A, from its initial blast observed three decades ago to the luminous ring of material seen today: The sequence begins with the star before it exploded. A ring of material was expelled about 20 000 years before the actual supernova happened. A flash of light indicates the actual stellar explosion which sends a shock wave outwards. As this wave slams into the ring, knots of dense material become intensely heated and glow brightly, while was with lower density is blown outward. This video starts with a view of the night sky as seen from the ground and zooms in onto the Large Magellanic Cloud, a satellite galaxy of the Milky Way. A further zoom shows the remnants of the supernova explosion 1987A, nestled between red-coloured gas, as they are seen by Hubble. The site of the supernova is surrounded by a ring of material that is illuminated by a wave of energy from the outburst. 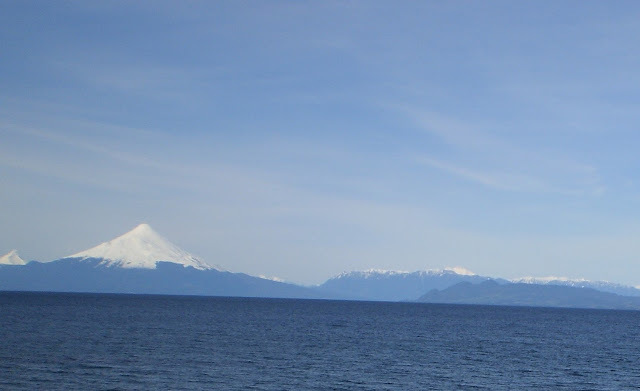 Two faint outer rings are also visible. All three of these rings existed before the explosion.